The prestigious event, which brings together professionals from across the film industry, including cinema owners, suppliers, film buyers and distributors, is the only Pan-Asian convention dedicated to the cinema exhibition and distribution communities in the region. At booth #201, Christie is presenting a comprehensive lineup of its latest offerings, including new groundbreaking cinema projection technologies, as well as innovative audio and lobby solutions that offer the best and the most complete cinematic experience to movie-goers. CP2308-C, lamp-based projector, which will be displayed in the Christie booth. A high-value digital cinema projector, capable of projecting 9,000 DCI lumens, the CP2308-C comes with an integrated DCI playback engine, built-in automation features, and a new, more user-friendly UX design interface. Perfect for cinemas with smaller screens, this unit will support alternative content sources through dual HDMI ports (along with the integrated DCI playback engine, supporting DCI cinema and streaming content). Alongside the CP2308-C in Christie booth #201 will be a technology preview of a digital-cinema laser projector, boasting a much higher efficiency than RGB lasers used in current cinemas. Also based on Christie’s latest Series 3 digital cinema electronics platform, this RGB laser projector has no need for sub-ambient cooling (i.e., no ‘chillers’ required) in a compact form factor, all-in-one design. Providing superior color, higher contrast, a future-proof design and low maintenance, this is the forerunner of a laser-projection solution that will prove to be an ideal replacement product for aging Series 1 and early Series 2 projectors. Another highlight at the booth is Christie Vive Audio, the world’s first audio system featuring Christie’s innovative wall and ceiling surround speakers, which are powered by unique, ribbon-driver technology in a parabolic line array design, purposely built for the cinema environment. 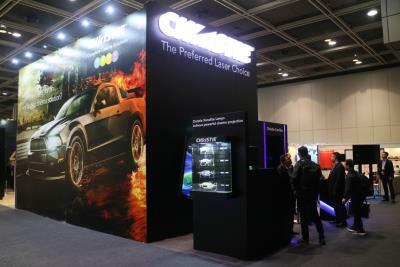 Products showcased in Christie’s booth include the LS1 line source loudspeakers, LS2S surround speakers and S218 subwoofer, which are set up for audio demonstrations that complement the stunning visuals projected utilizing a new RGB laser projector that we are previewing. The Christie Vive Audio system provides a hyper-accurate audio experience and unlocks the full dynamic range of the DCI digital cinema audio and supports leading formats such as Dolby® Atmos™, Dolby Atmos, 7.1 and 5.1 surround sound. Featuring planar ribbon driver technology with its low distortion and superior transient response characteristics, the LS Series screen channels at the booth are single-enclosure designs ideal for most 5.1 and 7.1 distributed sound applications. Christie Vive Audio system continues to establish its reputation worldwide as the next standard in immersive sound for cinema. Visitors can also check out the inventive “Christie Corridor” – a full-sized immersive cinema passageway similar to those found in contemporary theater complexes. Designed by the Christie 360 team to enhance customers’ pre-show experience, it comprises large extended screens displaying an array of cinema-related contents using Christie Captiva Series ultra short throw projectors and Christie Pandoras Box media players. Rounding out the impressive showcase is the display of Christie Xenolite lamps that offer extreme reliability, consistency and long lamp life paired with Christie Solaria® Series projection solutions. Utilizing the latest in Xenon lamp technology to provide increased brightness, improved stability and a longer life span, Christie’s Superior Performance (SP) Xenolite lamps offers more captivating 2D and 3D experiences, without a cost to overall lamp performance.